For those that live locally, this beach is known as Polly Joke, and it’s a stretch of shore that is relatively small and secluded. It’s wedged in a deep cove, and the dainty nature of the whole beach just enhances its attractiveness. Despite the size, you’ll still be able to enjoy a lot of exploring through the caves and rock-pools. Combine those aspects, with the luscious sand and overall relaxing vibe of the place, and you have yourself a truly excellent beach. This is one of those beaches that you’d typically associate with a country in the Mediterranean, not the coast of England. Why? Because it has a stunning, curved stretch of golden sand, and a clear blue sea that screams – ‘Come for a swim!’. Visitors have access to a prestigious little café and, if you wanted to do a spot of shopping, then Falmouth town centre is only a short walk away. Porthminister Beach is admittedly one that gets very busy (sometimes too busy) but it's all for a good reason. Porthminister's beautiful section of golden sand provides a perfect place to relax, and absorb the sun’s rays while viewing the Godrevy Lighthouse. With the presence of palm trees (yes, real palm trees) and the fresh crashing waves of the ocean, you’ll truly be able to feel like you’re on holiday here. There’s a small bar to get some tasty juices and smoothies, too, while its Blue Flag status highlights its class. First of all, Maenporth Beach is surrounded by greenery. So, if you want a sense of privacy, combined with original English countryside and clear waters, then this is a great option. For the most part, the sea is rather shallow, which not only means it’s family-friendly, but it also offers a good opportunity to explore rock-pools. Plus, it’s been said that when the water is at its lowest, you can spot the ship wreck of Ben Asdale (we've never actually seen it ourselves). If you’re a surfing fanatic (or even if you’re considering giving it a try), then you’ll be right at home on Polzeath Beach. It’s easy to get to and the waves are long, which provides superb conditions for surfing. The small beach doesn’t just attract dozens of surfers each year just for it’s waters, though. The beach also has a fantastic amount of open space when the tide is out and there are plenty of good pubs, shops and restaurants nearby. Alternatively known as Brea Beach, this long stretch of white sand is similar to that you’d find in the Caribbean – although, at this beach, you’ll also find a visually-pleasing addition of grassy dunes that provide an easier route for sea-side strolls. Other than the clear blue waters, you’ll also have tremendous views across Padstow Bay and the Camel Estuary while you’re sunbathing. Just around the corner nearby Daymer Bay Beach is also a treat. Kynance Cove is one of the most famous beaches throughout England, and people have been heading here for centuries to admire the work of Mother Nature. Coastal erosion has produced a multitude of red and green serpentine rocks, which gleam when wet like a form of theatrical art. In addition, there are rock-pools and caves for you to have a search around, as well as a tiny little section of golden sand. Bring a little net to make the most of it. Although this is a stunning beach that extends for roughly three miles, the cliffs, which stand proudly and beautifully behind the sand, often hide it. 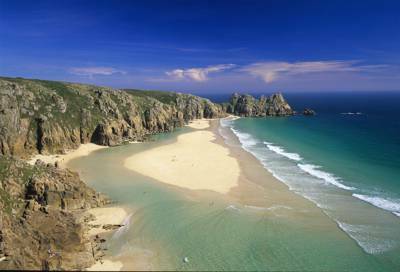 As a result, Whitsand Bay is widely considered a bit of a hidden treasure. It’s a superb destination for sunbathing, surfing or even going on a morning jog if you can handle the softness of the sand and it is dog-friendly all year round. Make sure you check the tide tables, though. When the tide is in, there’s no sand to be seen! Fear not though, if you arrive at high tide, there’s a couple of great cafés where you can get a decent cuppa. Yes, this beach may be on the smaller side, but that only adds to the aesthetics. The protruding cliffs in the backdrop, and the site of the Fowey medieval town to one side make this beach a fabulous spot to spend the day. Readymoney Cove is very secluded, so is ideal if you want to relax in peace by the sea rather than be a part of the hustle and bustle that you get with larger beaches. There’s an elegant stretch of golden sand at Crantock Beach, as well as marram-covered sand dunes that children love playing in. It’s extremely clean and well-maintained, so if you’re looking for a good family beach, you can’t go wrong. For extra entertainment, you can also hire surfboards or canoes at the beach shack by the beach entrance. Oh, and did we mention that dolphins are occasionally spotted here too?